A new, truly unique, pet-friendly, architect-designed pod house perfect for 2 holidaying families to occupy together. This house effortlessly absorbs its guests and delivers absolute peace, quiet and privacy, from neighbours and each other. Set on an oversized rainforest block in the naturally peaceful and pristine Austinmer escarpment, the striking home comprises a combined living, dining & kitchen pod with walk-in pantry and large wood burning fireplace, a kids 6-bed bunk pod with separate bathroom featuring shower and bathtub, an adults' pod with two queen bedrooms, bathroom and laundry, and a double lock-up garage (with optional ping pong table). 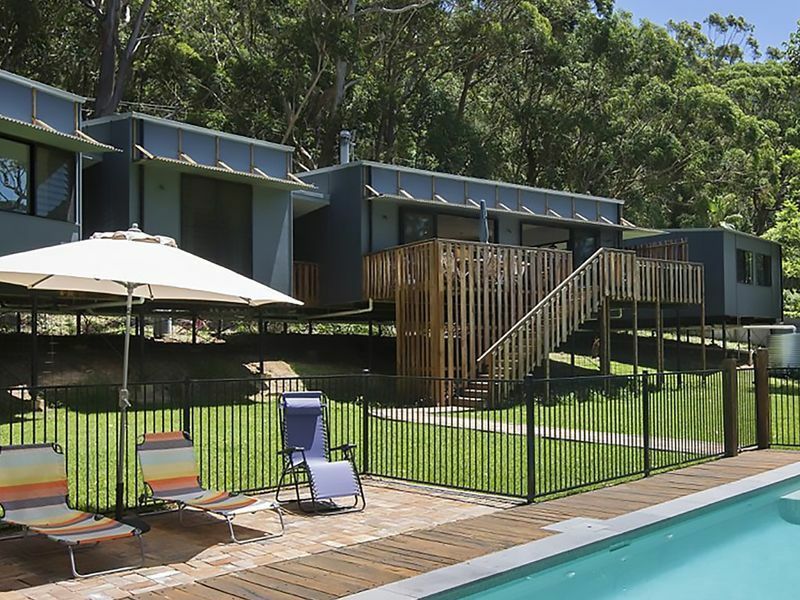 Each pod is separated by fully secure, open air timber breezeways. Noise doesn't travel between them at all, meaning you can sleep in while the kids entertain themselves in the living or bunk pods. The property features a 10x5 metre swimming pool, a mega-huge trampoline, extensive lawns and grounds, as well as an abundance of natural wildlife and flora. This home was architecturally designed as a modern take on a coastal bush experience, being located in a natural eucalyptus rainforest, with simple, yet perfectly functional areas perfect for two co-habiting families, separated by open air bridges, with the sound of the ocean drifting up through the trees from the beach just minutes below. The home is new and the gardens have recently been planted with an array of native and exotic wildflowers and trees, which will only further complement the property as they too develop their own beauty. Just a few minutes away by car is a huge choice of beaches, including Austinmer, Little Austinmer (off-leash dog friendly), Coledale, Sharky's (off-leash dog friendly), Thirroul and Mcauleys (off-leash dog friendly). It's dog and dog-owner heaven down here. Note: Dogs are welcome at this property only by prior arrangement. Thirroul is the nearest town (5 mins) and features a selection of chic shops, cafe's, bars and restaurants as well as supermarkets and bottle shops. Just over an hour from Sydney by both train and car, this is the family getaway that has something for every one. We look forward to welcoming you to our special bush beach house. IMPORTANT NOTE: NO PARTIES/ EVENTS/ LOUD MUSIC/ OR LOUD BEHAVIOUR, UNDER ANY CIRCUMSTANCES. ANY NOISE COMPLAINTS WILL RESULT IN AN INSTANT LOSS OF BOND AND REMOVAL FROM THE PROPERTY. NB: Minimum 2 night stay, except for Peak which has a minimum 7 night stay and can only be booked in weekly lots. Amazing view and comfortable setting. Well stocked with 2 fridges. Great stay for families and pet friendly !! Very relaxing. Kids loved it. We had a great time during our stay, good spot and cosy with the fire going. A fantastic Easter getaway for our family in this lovely bush beach house! We had a very relaxing weekend in this well appointed, well equipped and easy to live in house in the bush, close to beautiful beaches. A comfortable place to relax with our family over Easter.